Saturday - Borneo Headhunters HAT Ultimate Frisbee Tournament. Training for the Aviva Ironman 70.3 is below par, I think so. 3 weeks to the event. 2 weeks for the training and 1 week tapering. 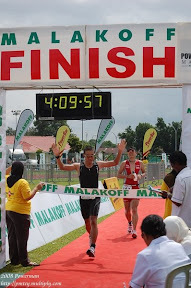 Since this is my first half Ironman, so the target is to finish the race and if possible to get it under 6:30 hours.